Gina Marie, Stephen and Josie Masson look and act like a typical family. 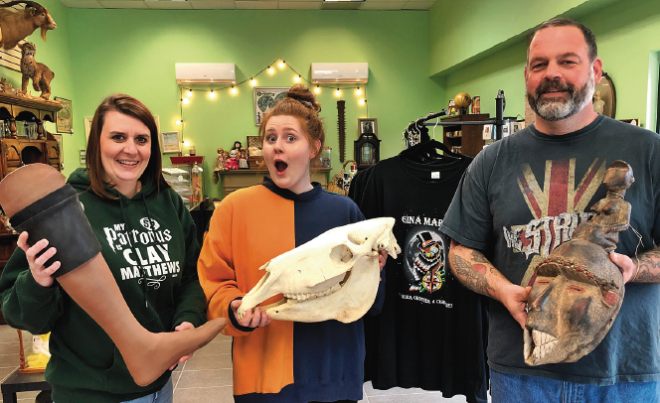 They joke and laugh, play with their headstrong, lovable bull terrier, and spend a lot of time working on their new retail space in downtown Shreveport. That is where the “normal” part of their story ends. When you walk into their store at 500 Texas St., you come face-to-face with weird. Sitting on one counter is a Church of Scientology E-meter that can “see thoughts.” On another is an antique embalming kit. On a third is a Chinese binding shoe. Scattered around the shop are a prosthetic leg and a doll head with pins protruding from it. Walmart is not losing sleep over this store, and Stephen, Gina and Josie are fine with that. After all, the name of the store is Gina Marie’s Antiques, Oddities and Curiosities. Curiosity and oddity shops have been part of the European and American traditions for centuries as purveyors of the strange, odd and curious. Similar to a sideshow at a fair or a Ripley’s Believe It or Not Museum, curiosity and oddity shops feature items that startle and spark interest. Their items – puffer fish and antique taxidermy, old medical quackery items and vampire kits complete with stakes – do not fit into a category that could be labeled “run of the mill.” When I told the Massons that our research into the history of their building showed it had housed an undertaker and coffin sales in 1885, they were thrilled to find a kindred soul. They already had a small coffin over the cash register filled with an array of odd and somewhat spooky dolls; the fact that their space was used by an undertaker had them feeling right at home. They are quick to point out that theirs is not a store of the black arts. They are not promoting the occult or the supernatural, but they are promoting the odd … and odd comes in many forms. During the time I spent with the Massons, dozens of Pokemon-playing millennials wandered in and out of the shop, remarking with joy at each new and strange discovery. An older man came in looking for a voodoo doll; a young woman bought a skull cookie jar. Many of the items on the shelves of the shop are part of the Massons’ personal collection of oddities, being sold to make way for more. Stephen and Gina Marie had been looking at the historic building at 500 Texas for years thinking it the perfect location for their business. When they heard several months ago that the building was finally sold and being rehabbed, Stephen says he felt the stars had aligned. He and Gina Marie have big plans for the small space. They are steadily adding to the collection of oddities, but the stock will always be changing. “Come in often,” Gina Marie says, “because you’ll never know what we’ll have or when we’ll have it.” Stephen pipes in, “Never, ever be afraid to ask questions about what you’re looking at.” Curiosity and oddity shops have always been used for education, to broaden horizons during a time when travel, access to books and schooling were far less common. The shop is open Monday-Saturday from 11 a.m.-7 p.m. and will be part of both Small Business Saturday on Nov. 24 and the December Downtown Artwalk on Dec. 5. Gina Marie, Stephen and Josie would love to see you, to shock you, to sell you something that could be the most talked-about item you have ever owned. Liz Swaine is the executive director of the Downtown Development Authority. She can be reached at liz@downtownshreveport.com.